A patio is a place where you can come together with your family and friends to sit back and enjoy each others company as well as a nice meal. It is your entertaining area. You can also enjoy the views of your landscape gardens. Some homes com with a patio built in and others may not have one. In this cases if you have recently purchased a home which does not feature a patio why not build one of your own. Careful planning and design should be carried out before you start to construct your patio. The most important decision to make is what type of flooring you are after. Things have changed over time the days of when patio flooring was a plain old concrete slab are gone. Pavers are in. 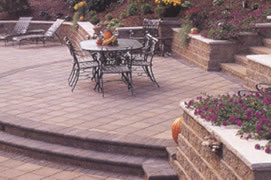 Pavers are the ideal pavement material especially for patios. Patios can be small or large long or short. Pavers are easily installed and maintained. They are the ultimate choice for construction a patio. There are many types of pavers for you the home owner to choose from. You have concrete pavers, natural stone pavers and stone pavers. They are all suitable for the application of a patio. They all will offer strength, durability and long lasting qualities. Pavers offer many natural and man made colors that can be mixed and matched to your patio furniture. Patio furniture will not scratch or affect the surfaces of most pavers. There are certain sealers which are made available for you to protect the top coating of your patio pavers. 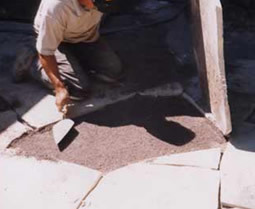 Most pavers can be cut to a specific size or shape. So this is a great advantage for you because there are no limitations when it comes to choosing a design of your own. This article will run through a brief step by step guide on building your patio with pavers. Step 1: excavate the area you have decided on placing your patio. It needs to be at least 8 inches in depth to allow for 4 inches of sand base material. Use a string to guide you to excavating the shape you desire. Step 2: apply a landscape fabric to the excavated site. A landscape fabric is design to prevent weeds from growing in between the joints of the pavers. Make sure that the fabric is large enough to cover the whole area nicely. Step 3: start to build a frame using timber on the outer edges. Using plywood build it up to at least 4 inches above the ground. Step 4: apply the base material and spread it out evenly. Then run a compactor over the area. Step 5: apply sand base and spread it out evenly. Then level it out. Step 6: start to apply the pavers one by one. The laying pattern is all your choice you may require an easy one like the running bond pattern which is pavers being laid side by side. If you choose a pattern that may be too complicated seek your manufactures advice as they can offer you a grid chart on how to lay the pavers. Step 7: once you have laid out the pavers evenly apply another coating of sand and use a broom and spread it out ensuring that you fill in the gaps. You may need to carry out this procedure several times just ensure that the joints are completely filled. It is recommended that you check the levels of sand after a heavy rain storm! That is so easy and simple! While you leave the patio pavers to set why not jump in the car and go shopping for so stylish patio furniture like tables, chairs, pots and urns. Your patio will be you pride and joy a place that is peaceful and joyous so enjoy it! This entry was posted in DIY, Patio and tagged DIY, How to build a patio, patio pavers. Bookmark the permalink.